I have that old Crowded House song in my head. “Can I have another piece of chocolate cake?” The rest of the lyrics deal with buying cheap Picasso fakes and Andy Warhol laughing in his grave. No idea what it’s really about but I’m happy because my weekend chocolate cake attempt was fantastic! Let’s say I’m a fairly decent cook. I throw savoury things together hurriedly and the flavours work; when I set my mind and time to recipes they mostly perform on cue. I’ve never been great at pastry but I used to be pretty good at baking when growing up. British cooking wiz Delia Smith says baking is the one area where you have to stick to precise measurements and she’s right. So I’ve found it incredibly annoying that after spending years in Asia where stirfry-orientated stovetops are standard in rented kitchens but ovens are not, I was finally armed with baking tools again. A reliable Defy oven, and a coveted Kitchen Aid artisanal mixer, the latter a collective wedding gift from generous family. Yet I still had baking flops. Was it the recipe, the oven or me? The lightbulb moment was when somebody told me conventional fan-assisted ovens should be reduced by 10 degrees, the baking time shortened by five minutes or so. I’ve edited enough chefs’ recipes and found crucial steps omitted to not even attempt some of them. I was in search of a rich and gooey chocolate cake recipe, ditching plainer versions from the very user-friendly cookbooks of Ainsley Harriott, Tessa Kiros, Rick Stein, Pete Goffe-Wood and Lannice Snyman in my collection. Then in a worn copy of Donna Hay’s Flavours I found an entire chapter devoted to chocolate recipes. 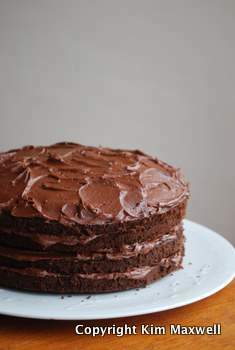 A layered chocolate fudge cake sounded perfect, the synergy with Donna’s cookbook name only sinking in later. The result? Reducing the oven temperature and baking time meant the recipe worked like a dream. Quality Nomu cocoa powder for the sponge, double layers halved and filled with chocolate cream. A word of caution. This was no budget or diet-friendly version; three packs of melted Lindt 70% chocolate later, blended with butter and cream… But it was delicious and the sugar-free fudge frosting kept it bittersweet and not overly rich. A splash of Frangelico liqueur even kept it decent on day three. Three rugby-watching boys on Saturday afternoon were extremely happy to supplement their beer and biltong with a coffee and chocolate break. And most importantly, it seems I’m finally getting my baking groove back! Contact me via email if you want to try Donna Hay’s delicious recipe, with my modifications. I’m reducing the fudge quantities as there was a heap left over. I really like the site and enjoyed the articles. Now if only you could get the recipe for that lemon curd baby in the blog cos that also looks spectacular. Will do my best to persuade the passionate purist to part with hers too! But I can't promise - she was embarrassed that the cake looked 'horribly lopsided' which of course I don't agree with at all... As mentioned, it tasted delicious. Kim, would love that recipe. Fortunately for me I have a fan assisted oven that can also be used without the fan assist. So I use the fan to heat up the oven and then turn it off to bake. Gary says he wants that for his birthday. Who says we have to wait for his bday. Good for you starting a blog and all the best with it. Hi Kim, I would also love to try this recipe! And for those like me who most of the time, end up with flops - a few months ago I discovered Cassis Paris, in Kildare road, Newlands. They have a selection of divine cakes (to buy and order) and I can recommend the Douceur Noisette! Heaven in a box! Your recipe has been emailed... I've shared an eclair from Cassis Newlands too. Was really a cut above the rest. Was wondering if you could teach me how to make this cake and I will write about it, and then eat the whole thing. Let me know. Me teach an expert pastry chef like you how to make a cake? That's a joke right, Vanessa?!!! may foresee troubles just before these people happen.